Hope you are having a good weekend or good start to the weekend depending on where you are. My Saturday just began. While everyone is still sleeping , so I decided to blog. I finished this card Thursday morning and I didn’t have time to blog until now. My in laws were visiting us and stayed with us for two months. It was super busy for these two months and time was limited. They have gone back to India now. I am still stuck in the routine of waking up early which is why it is a great time to blog. 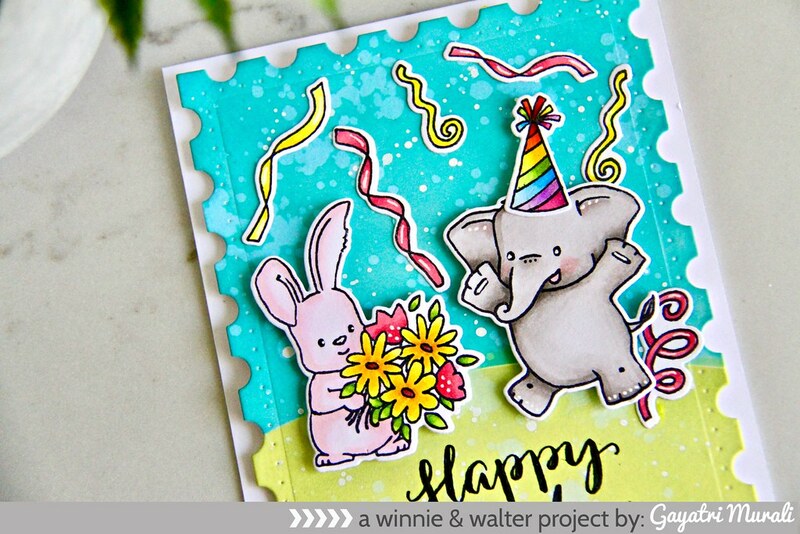 As part of me participating in Kathy from The Daily Marker’s 30 day colouring challenge, I coloured these images from Winnie & Walter’s Happy Dance with Evelin T designs stamp set. I love these cute critters. The plan initially was to watercolour them. But on Thursday, it was not happening. I was multitasking and I had no patience what so ever to do watercolouring. Lets just say it was a hot mess. So I ditched watercolouring and instead stamped the images again on white cardstock to do copic colouring. I coloured these images multitasking cooking, help packing, cleaning, phone calls, making tea….. You name it! So much distraction Grrr. Anyhow, I finished it all and made this card which I am very happy to share. 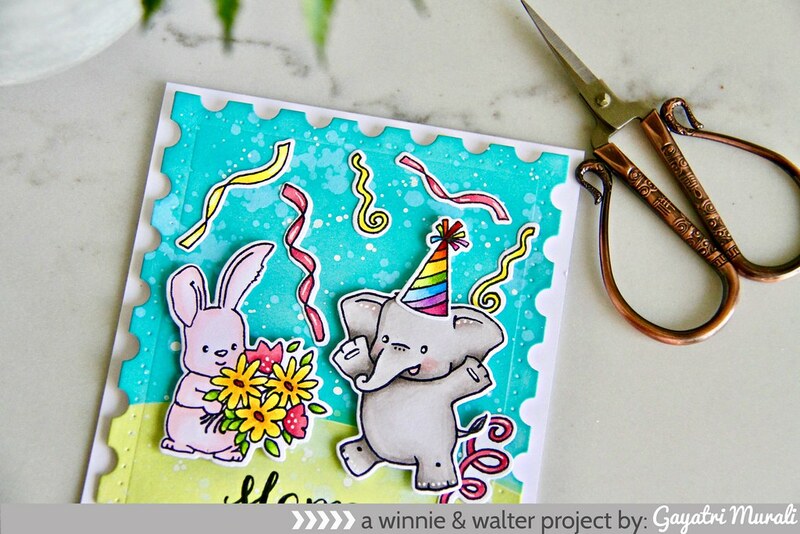 I die cut a white cardstock using the largest die from Essentials: Lana Cutaway.This set is from Winnie and Walter. I masked the bottom and sponged Peacock Feather Distress Oxide ink for the sky and masked the sky and sponged Twisted Citron Distress Oxide ink for the ground. Spattered water and copic opaque white and left the panel to dry. I die cut the copic coloured images from Happy Dance stamp set. 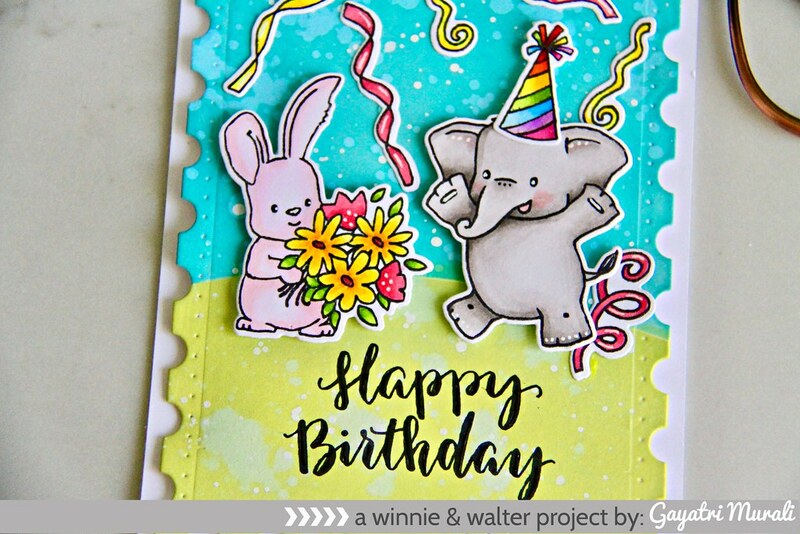 Although I coloured all the images from the stamp set, I am using the elephant and the bunny with the flowers along with some streamers for this card. I die cut all the images using the Happy Dance coordinating Cutaways. 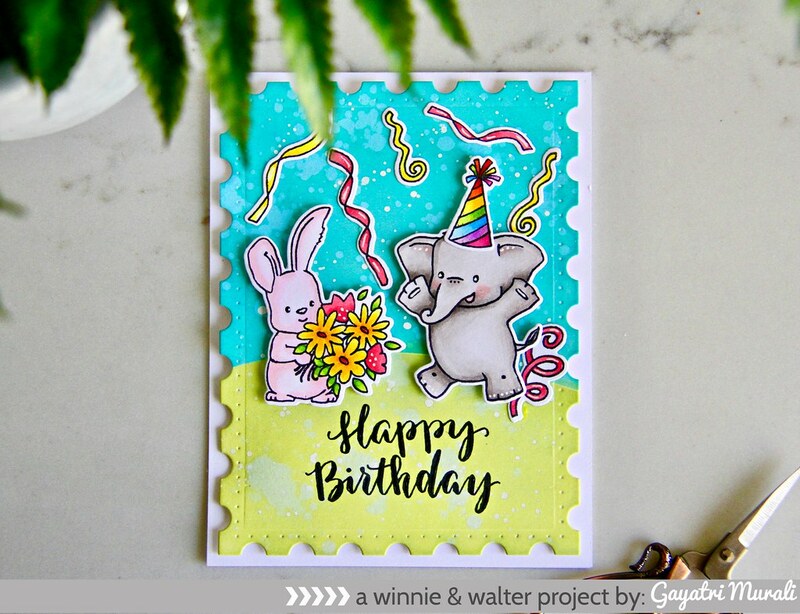 I adhered the bunny and elephant images as if the bunny is giving the elephant the cluster of flowers on the sponged panel. I used foam adhesives to add dimension. The streamers I randomly adhered using glue. I also adhered the birthday hat on the elephant. Using MISTI, I stamped the sentiment also from the same stamp set using Versafine Onyx black ink. Then I used Sakura white pen to add details and highlights to the images. This completed panel is adhered on white card base. 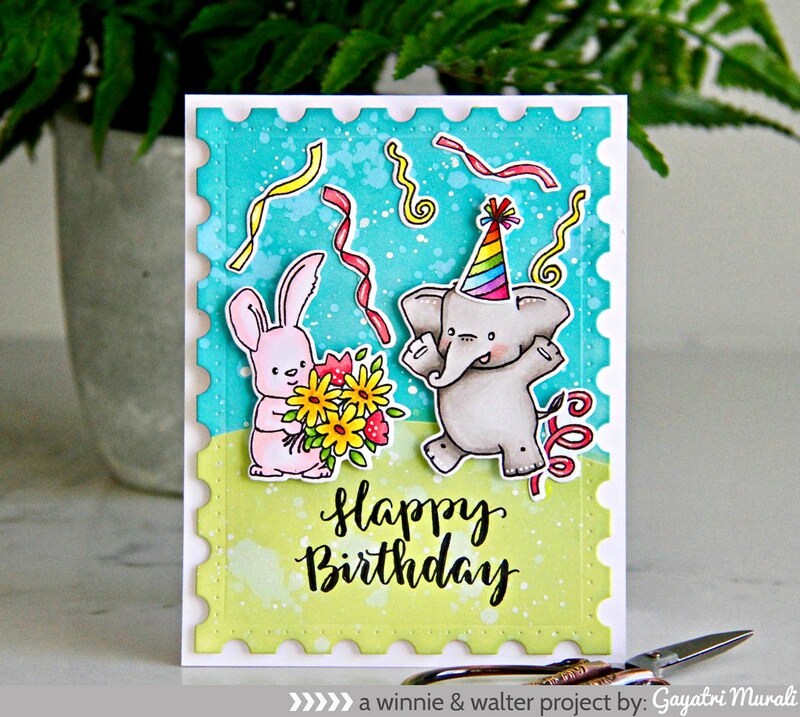 The stamp set and die set used to make this card is from Winnie & Walter. I am loving colouring everyday. Cannot wait to colour and share more this weekend.